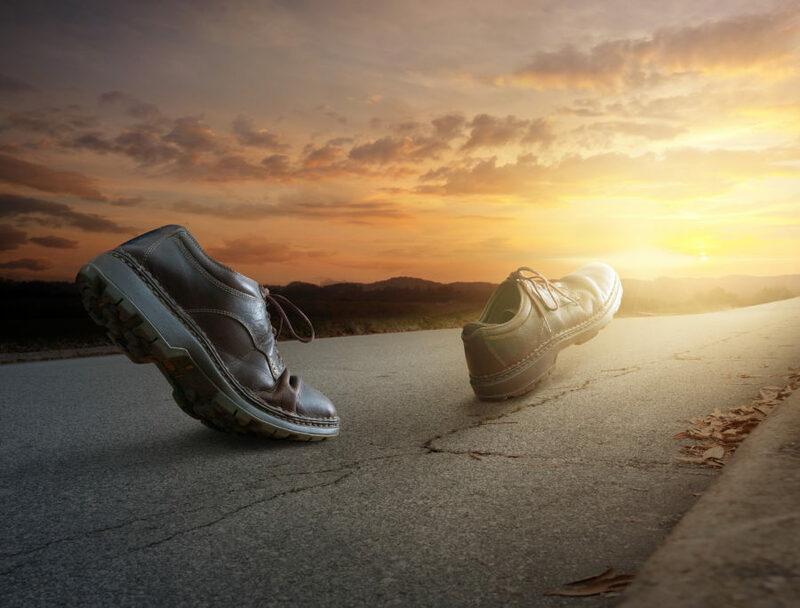 Why Does Emotional Neglect Make You Feel You Are Running On Empty? To be honest, I was somewhat unprepared for this question, and I stumbled a bit. The only answer I could think of at first was: “Because that’s what Emotional Neglect makes you feel.” It made such intuitive sense to me that I had never even thought about how to explain it. Since that day I have been asked that question many, many more times. And I have put considerably more thought into how to describe the relationship between Emotional Neglect and emptiness in a way that makes not only intuitive sense but also offers helpful personal understanding to those who grew up emotionally neglected. First, we’ll define what “Empty” actually feels like. Then we’ll talk about what it means to be running on empty. What Does “Empty” Feel Like? Here are some of the ways I have heard it described by many different people. As you can probably see from the different expressions above, “empty” can feel different to different people. Yet, for all, it comes down to one common factor: a deep, uncomfortable sense that something important is missing inside of you. Just as all of our feelings are messages from our bodies, so also is emptiness. Emptiness is a real sense of a real thing that really exists. When you have Emotional Neglect, you are indeed missing something. Something valuable and dear. Something that’s required for a happy, connected, and fully engaged life. Childhood Emotional Neglect (CEN) happens when your parents fail to notice, validate, and respond to your emotions enough as they raise you. When you grow up with your parents failing to notice what you are feeling, you are growing up with the most powerful expression of your deepest self (your emotions) ignored. What is a child to do? Fortunately and unfortunately, children’s brains automatically step in to protect them in these situations. When, as a child, you perceive, on some level, that your emotions are not welcome in your family, your brain automatically walls them off for you. This way, those troublesome feelings won’t burden you and your parents. In many ways, this coping technique is brilliantly adaptive. But it’s also what makes you feel empty as an adult. Growing up and moving forward in your life, you are not aware of what your brain has done for you. You are not aware that your feelings are blocked from you. You are not aware that you are living your life without full access to a key life ingredient that everyone else has: your emotions. In previous writings, I have compared the experience of running on empty to eating a cake baked without enough sugar, playing the role of “extra” in the movie of your life, and living under cloudy skies. When you are engaged with your feelings, and you are actively managing them and using them, you gain many important advantages. Your feelings will tell you what to pursue and what to avoid, what and who to care about, and what you want and what you need. And they’ll provide you the motivation and energy for all of those things. When you are deprived of this natural, rich and connecting resource, you tend to drift, not quite knowing who you are or what to do. You end up giving without receiving enough back and depleting your own resources to your own detriment. You may even set up a good life for yourself but still wonder why you’re not happier. Why am I running on empty? Surprisingly, there is an answer to running on empty. You do not have to live this way for the rest of your life. The way you become full is to do the opposite of what you learned in childhood. You grew up with your feelings ignored, so now is the time to change that. It is never too late in your life to alter the way you treat your emotions. Even if you feel numb now, your emotions are there. They are waiting for you on the other side of that wall you built in childhood. To reach them, you must first begin to see their value. When you invite them into your life, they will come. You can chip down that wall that blocks them off, and learn the skills to manage them. Then lastly, you can learn how to use them to enrich and deepen and strengthen your relationships. So why does Emotional Neglect Make you feel you are Running On Empty? As a child, it was because your parents, perhaps unintentionally, discouraged your feelings. But now, it’s because you are continuing to ignore your own feelings. But you are grown now. You are in charge of your own decisions and your own life. You can make the decision to stop running on empty. 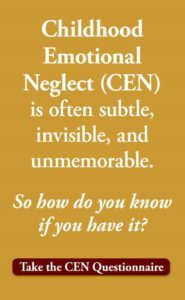 To find out if you are living with the effects of Childhood Emotional Neglect, Take the Emotional Neglect Test. It’s free. 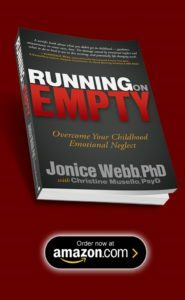 To learn how to break down the wall that blocks your feelings and begin to use them, see Running On Empty: Overcome Your Childhood Emotional Neglect. 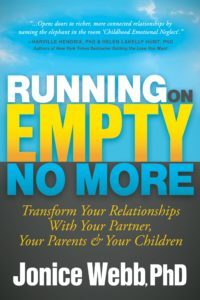 To learn how to use your emotions to strengthen and enrich your relationships, see Running On Empty No More: Transform Your Relationships. The feeling is being the lone person in the audience where it is dark, and seeing everyone else on the well lit stage all talking among themselves, and knowing you will never be able to go on the stage, you must stay where you are. They would never allow you to join them. Dear dfk, that is a vivid description of your experience. Thanks for sharing it with us!